ABOUT THIS INTERVIEW: Freshly back from performing in Hamburg, John Lennon and Paul McCartney spoke in Liverpool with NME's Alan Smith in what is one of the earliest of Beatles interviews. The article entitled, "You've Pleased-Pleased Us! - say The Beatles" would be published in the February 1st 1963 issue of the New Musical Express. In this very brief chat, both Paul and John discuss the writing of their latest single, and Paul also mentions songs they have written for other artists, including one they had intended for singer Helen Shapiro. The Beatles were still in the earliest stages of their local fame. Their second single 'Please Please Me" had just been released two weeks prior, and had just debuted at number 17 on the British charts. 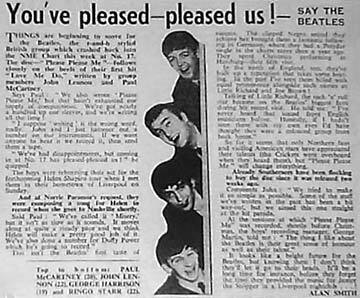 At the time this article was published, the Beatles have not yet had a number one song. In time, the song "Please Please Me" would rise to become the Beatles' first number one single in Britain. It's popularity would convince producer George Martin to promptly record the band's first album. No one could ever imagine the long and winding road in store for this young Liverpool group. Things are beginning to move for the Beatles, the R&B styled British group which crashed into the NME charts this week at No. 17. The disc -- 'Please Please Me' -- follows closely on the heels of their first hit 'Love Me Do,' written by group members John Lennon and Paul McCartney. Says Paul: "We also wrote 'Please Please Me,' but that hasn't exhausted our supply of compositions. We've got nearly a hundred up our sleeves, and we're writing all the time! "I suppose 'writing' is the wrong word. John and I just hammer out a number on our instruments. If we want anyone to hear it, we record it, then send them a tape. "We've had disappointments, but coming in at No. 17 has pleased-pleased us!" he quipped.